This is an issue that’s hitting the A/V nerd community. Serious problems result when newer Mac’s are tied in with “display port”. We’re in the process of creating a reliable cure, but nobody else has done this yet. OK folks, here’s the scoop on the encoded Mac Display Port outputs. They’re no longer simply Display Port outputs. As of late last year, all new models of MacBooks, Air’s, etc. 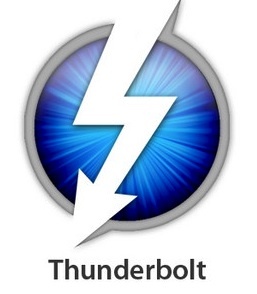 now employ the Thunderbolt output. It does the video output from the same size mini DVI, along with much more…..much more than we want it to do for our purposes. Apple employees are instructed not call it a display port any more….which is a bit unnerving in itself. In other words, it tries to “talk” to every piece of equipment in the signal path. While we believe we have a few ways to conquer this little challenge, nobody really has a 100% reliable fix for this yet. The EDID boxes that Bob suggested may very well to prove the most reliable way of fooling it by locking in the signal to a Thunderbolt compliant monitor first, then routing into our system. Mac is getting too damn smart for it’s own good. The deeper we get into this, the more interesting and painful it gets. I didn’t do all the research myself, I’ve just been compiling widespread conversations on the issue for a few weeks now. We’ve had an all-star cast looking into this including, San Francisco-based AV professionals: Luke Sullivan, Harold Brown, Dwight Kiyono, Bob Hines, Andrew King, Jaime, an Apple employee named Louis, Johnny Good, who’s shaking his head in despair and cursing Apple, Lou Abaurrea and more. Out of those to a VGA splitter might fool it if it’s done in the right order with a compliant monitor. I’ll update as our misadventures in addressing this transpire, it’ll be interesting but hopefully we can bail some other folks out with prior notice. It looks like the best solution for the emerging problem. They’re definitely on top of the situation. Please distribute this info as you see fit! 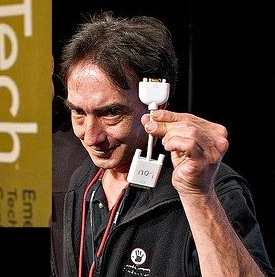 Lorin Nelson is a SF Bay Area-based Technical Panic Alleviation Technician. “I do the work you’d rather not do.” He studied at BYU/Chico/Stamislaus/Santa Cruz, and regularly works on large scale AV events as a projectionist, composer, nerd and fire extinguisher. Tips for Webcasts and Online Video Calls: Lights, Camera, Etiquette! Making a positive first impression is critical in any situation. Whether it’s a business meeting, live event or online video, your appearance and delivery is key to your success. Now, with vast improvements in video quality it’s become the norm to watch webcasts or meet and greet each other on one of the many video platforms, including: WebEx, Skype, ooVoo, Google Hangouts, Ustream, Livestream, Qik, and many more. With all the technology, the simple rules of proper etiquette when using these tools become more important than ever. Making sure you sure you have good lighting and sound is not enough. According to Lisa Gaché, Co-Founder and CEO of etiquette education company Beverly Hills Manners, the lack of etiquette can derail the effectiveness of a video conference session. When it comes to video conferencing, there are some things you definitely shouldn’t do. Be sure to behave on camera because people can always see you on group video calls, even when you’re not speaking. 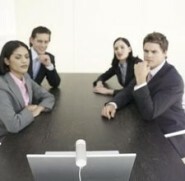 Check out this video, What Not to Do During a Video Conference by NoStaticST, for good video conferencing etiquette. This short video, What Not to Do In a Webcast by webcasting vendor MediaPlatform, presents the things to avoid when making a corporate webcast presentation. It’s based on, “Image Secrets of the Corporate Webcast by Ken Molay“, which he shares his techniques to make video presenters appear confident, poised and credible in a web event, considerations for proper lighting, seating, background, and dress, best practices for posture, eye movements, and body language, and how to make appearing on camera stress-free for your presenters to have the greatest impact on their audience. Pick a facilitator to help manage any over-exuberant participants. Pay attention and listen – if you try to fake it, you’ll be caught. Remember you are meeting face to face on clear video, so remain aware of your facial expressions and monitor them so you send the right message. Don’t eat or drink during a business video conference call. In summary, you have to be aware of what you look and sound like, and what your environment says about you.